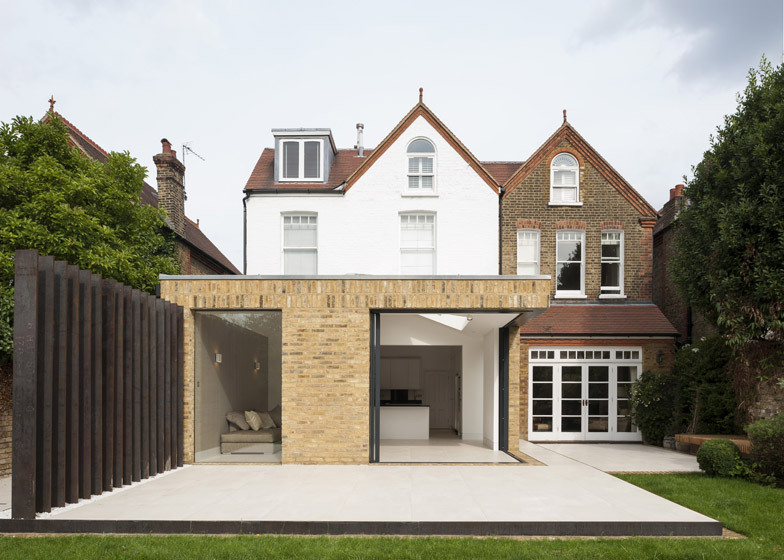 This London house extension by Tigg Coll Architects features sliding glass doors that retract into the brick walls to open the space up to the garden (+ slideshow). London studio Tigg Coll Architects was tasked with providing a new kitchen and living room for a couple whose children had recently moved out of the Malbrook Road residence. "They asked us to look at how the home could work for them differently, as their lifestyle is now changing," architect David Tigg told Dezeen. "They wanted us to create entertaining and living space that would connect them directly back to the large garden, and they were open-minded in their approach." Tigg Coll – whose previous projects include a refurbished maisonette with a light-filled stairwell – based the proportions of the structure on the dimensions of a brick. This ensured that all openings are framed by full bricks, which have been laid vertically and horizontally. 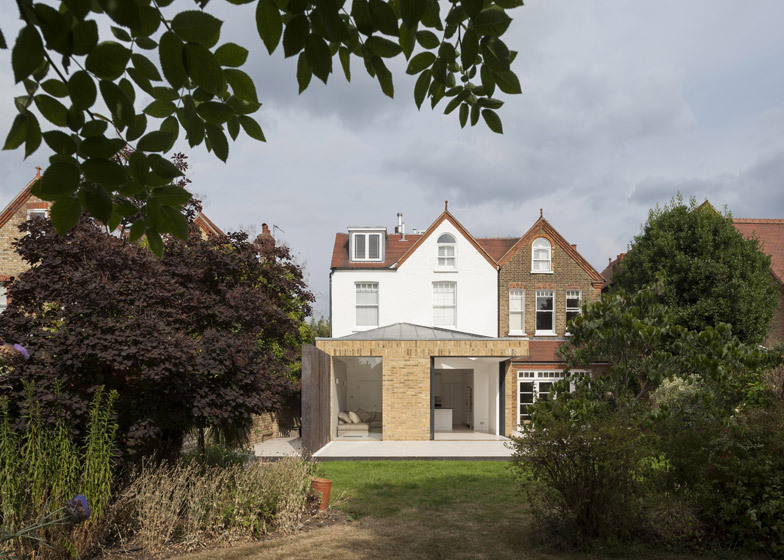 "Although we wanted the new extension to feel contemporary in form and use, we also wanted to use a material that would link this new aspect back to the history of the existing building and area as a whole," said Tigg. "If done well, brickwork adds movement and texture, and will stand the test of time." Dark-grey powder-coated aluminium window frames were used to keep the appearance of the windows as minimal as possible, while pockets in the walls allow a corner of sliding doors to be hidden from view when open. "The glazing is hidden in secret pockets between two leaves of brickwork on adjacent walls," explained Tigg. 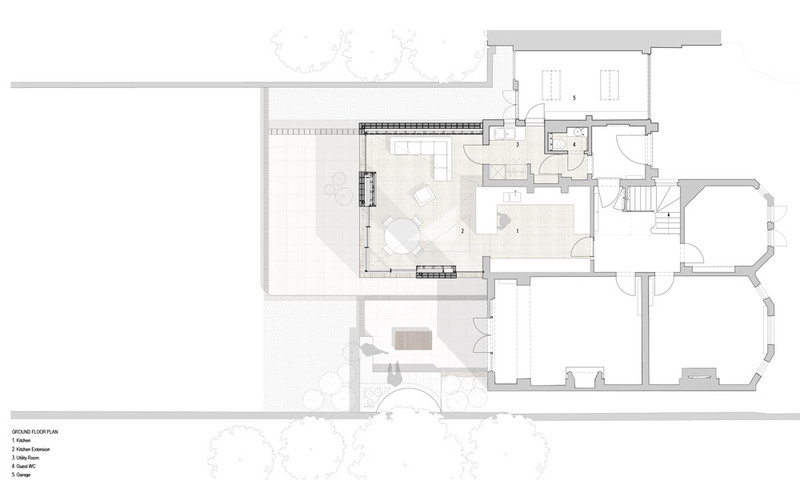 "This detail opens up the corner entirely and allows the inside to fully address the patio and garden." 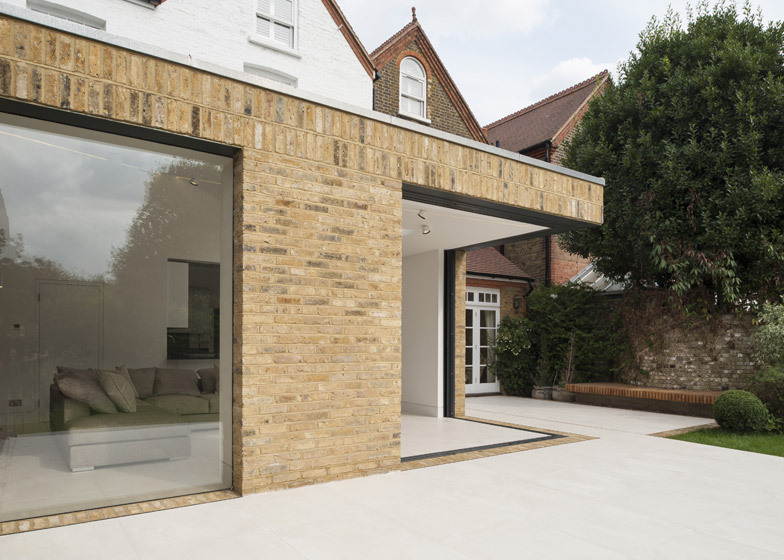 A row of bricks continues from the walls on to the ground to mark the threshold between indoor and outdoor space. "We were very conscious that we wanted to emphasise the threshold," said Tigg. 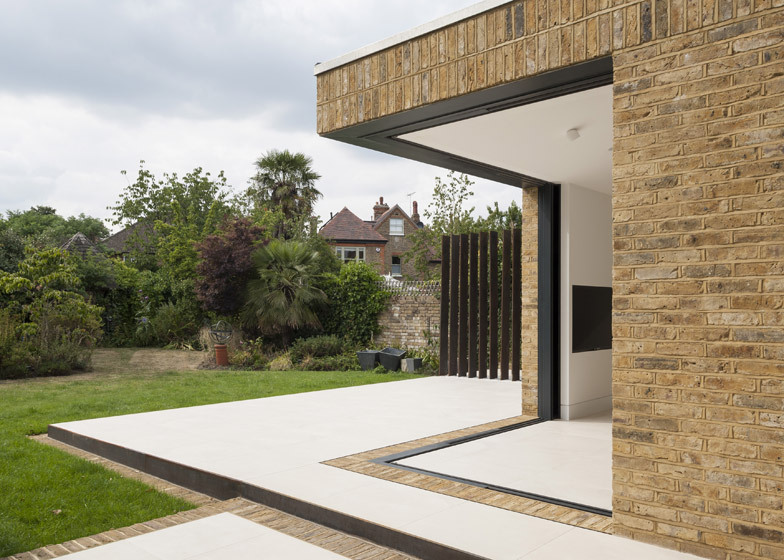 "We like the idea that although the indoor and outdoor spaces are linked, they still remain different and the brick threshold helps to emphasise this." Large white porcelain floor tiles have been used inside and out, chosen to create a noticeable contrast with the garden lawn. 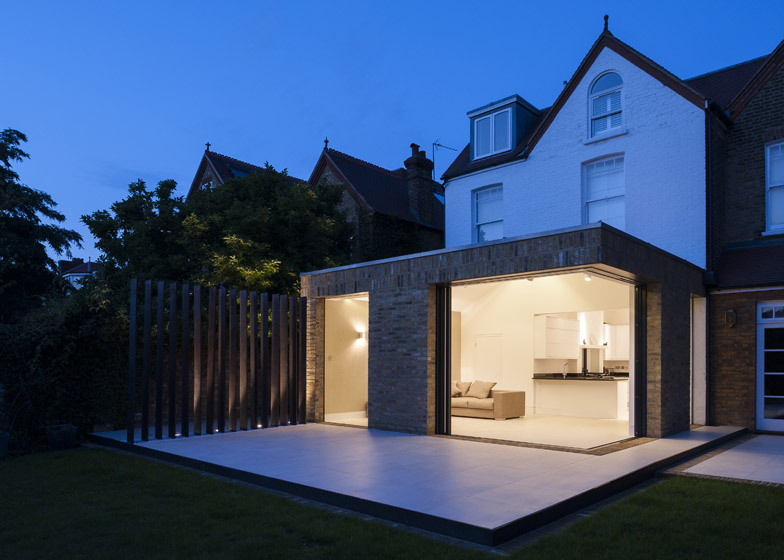 The architects conceived the extension as a pavilion-like building, and designed its roof with a subtle pitch to echo the shape of the existing house. 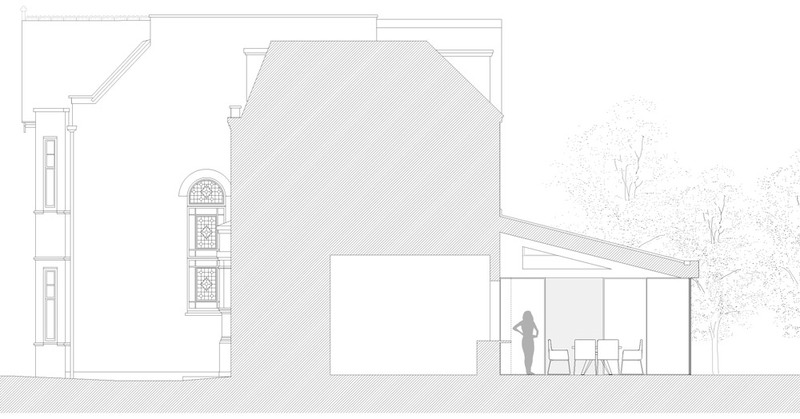 "A flat roof would have been too blunt and predictable," said Tigg. 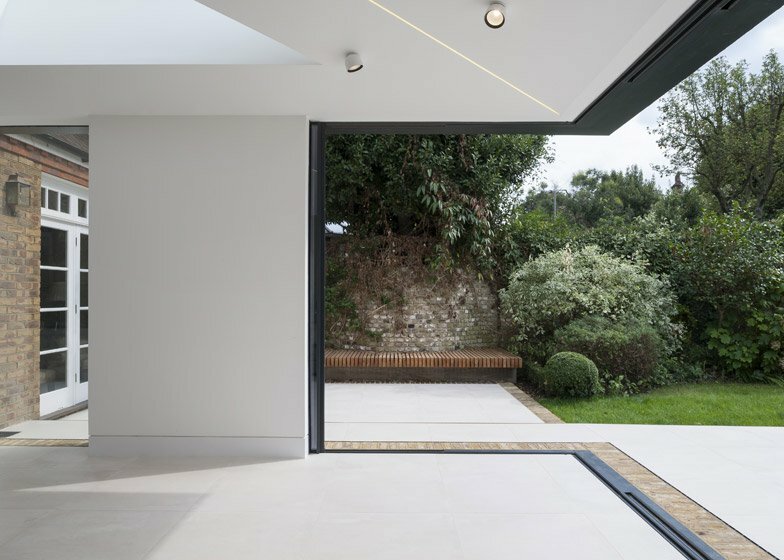 A rooflight at the side of the extension ensures light reaches the kitchen, which is deeper in the plan. 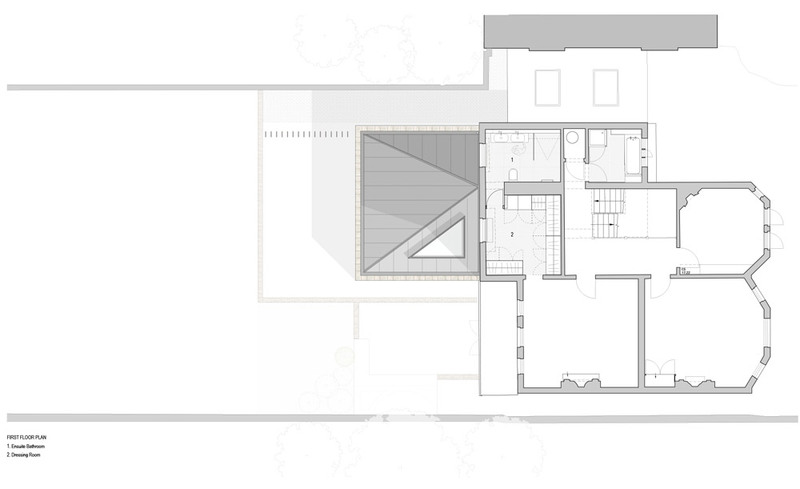 Its triangular shape was chosen to emphasise the roof's faceted shape and provide a counterpoint to the more traditional rectangular shape of the house's existing interiors. A recessed strip of lighting in the ceiling was also chosen to emphasise the roof's faceted form. "It gives a soft glow that really lifts the space in the evening," said Tigg. In the garden, vertical fins made from Corten steel follow the line of the side wall to help lead the eye outside, and give the patio a sense of enclosure. "We wanted a material that would mellow nicely with age and balance well with the old-stock brickwork, yet at the same time feel contemporary and hard-edged. Corten steel was the obvious choice," added Tigg.